The Brazier family coat of arms shield has three rings argent on a red shield divided by a gold band. Above is a dove of peace. 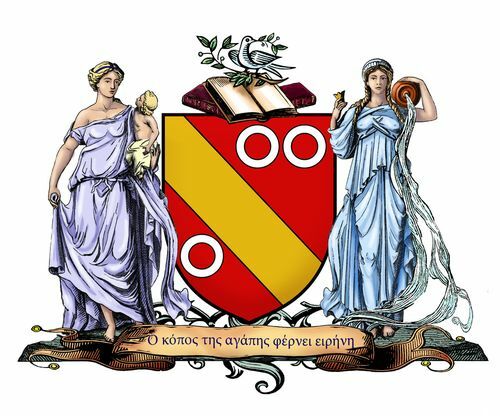 The three books represent prose, poetry and scripture and below the Greek motto says "Labours of love bring peace", the whole design is flanked by the goddesses of peace, Eirene, and love, Aphrodite, the former carrying the infant of prosperity, Ploutos. The dove links the two goddesses as the dove is the symbol of peace (Eirene) and also the bird most closely associated with Aphrodite and the cooing of lovers. Given its industrial past, Bilbao is a strikingly handsome city. Its renaissance puts me somewhat in mind of what has become of Newcastle-upon-Tyne, another northern industrial city with new arts centred development. In fact the parallels are quite strong. The Basque people, like the Geordies, have a distinctive local culture. The weather here is constantly changing and many of these pictures were taken in low light. This is a spectacular bay with a spiritual atmosphere. It has probably been a sacred spot since pre-Christian times. At the western end of the bay is a peninsula with a causeway ascent to a small church dedicated to John the Baptist. In the middle of the bay is an island. The shores are rocky pavements with strata at oblique angles. There are over 200 steps down and up. Good exercise. Good for the body and the soul. It is Wed 10 Feb 2016 and David has been discharged from hospital. He has been told from the doctors that his blood is finally good but will continue to be treated for a while as an out patient. We Korean friends will miss you a lot all through the year. Wish you peace and joy in the light of the Amitaba Buddha. Now we are happy because you are home and back to your work.